So we recently purchased an iPad2 and one of the apps I was most excited about trying was Days of Wonder's Small World App. 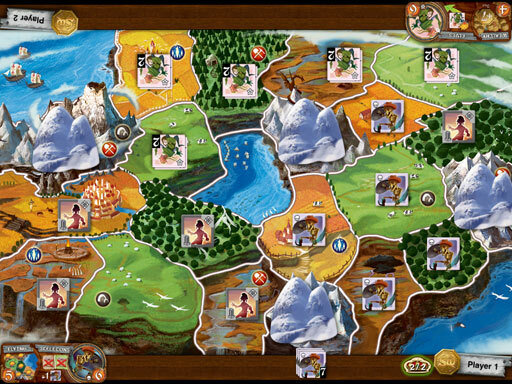 I won't give it the full review, but this incredibly well-done application (See information here) essentially ports Small World's 2-player board game experience into the tablet. It looks incredible and it makes you wonder if this is the first step for games and gamers alike to be pushed into a more digital medium. Is this the future of the hobby? Certainly, there are a number of other board games on iPhone/iPad and on the consoles (my most recent search came up with over 300 for the iPad alone), but this is the first that, in my opinion, really gives you both the look and the feel of the game and allows you (it is designed) to play the game like you would in a real board game setting (i.e. using the tablet as the board). It makes you wonder how many more games are going to get this treatment. I myself have dreamed of the digital board gaming table where you would load your games into it and it would set up your digital chits/pieces/etc. This would make playing games a lot faster and make clean up a lot easier, and if it was internet-enabled, it could allow for folks to play games with friends and family across the world. This app essentially accomplishes this for Small World--without the internet capabilities (you cannot play this version over the internet). You have to imagine that more games are going to get the iPad treatment in the near future and it makes sense. . .instead of going to the basement, setting up the game and playing, my wife sets the tablet down, clicks an icon, types in our names and there you go. I don't know if any of this is necessarily a good thing, but it's likely to happen eventually. I'd be interested in your thoughts and I'll keep my ear/eye out for the next set of iPad board game apps and see if this is going to be a trend for the industry. Digital gaming table is awesome. I myself is also dreaming of it but I'm sure that would cost a lot of money. Hope there will be a discounted digital board. Great post. Keep it up. Hey! that's my fish goes mobile. Fun in the board game kitchen? TI Expansion preview and other news.